“How long does it take to fit a new bathroom?” is a question routinely fielded by members of the NBC Construction team as our clients (understandably) want to know how much disruption they’ll have to deal with. To give a truly accurate answer we’d have to see your bathroom and find out what your plans are for the new one but that doesn’t mean we can’t offer you any answers at all! Obviously there is no exact amount of time that it takes to fit a new bathroom due to the amount of variables in each project, but we can help to give you a rough idea of time frame; on average, it takes between seven and fourteen days to completely strip and fit a new bathroom in the UK. 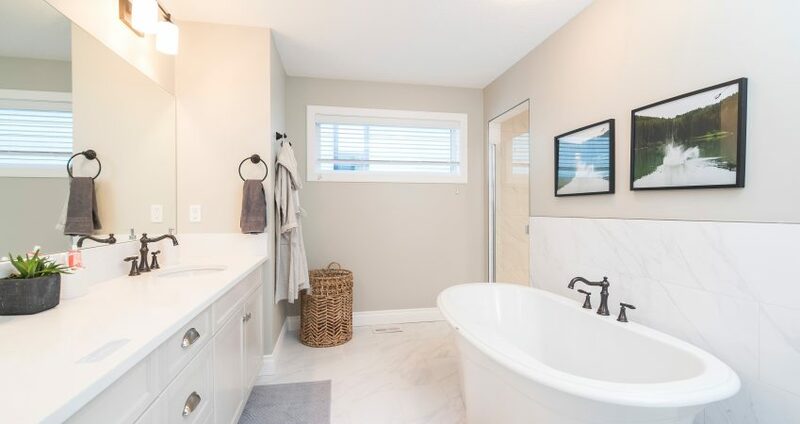 Of course, when other limiting factors and variables come into play, things can take even longer – larger bathrooms can take double this time, and a nasty surprise found in the walls or floorboards (such as mould, dry rot, or asbestos) will set the project back even more. There are certain actions that need to be taken for a bathroom fitting, and these all require a certain amount of time to carry out properly – it will need to be stripped, and structural changes undertaken, and the walls will need to be plastered to ensure a smooth a level surface for tiling. Adequate drying time will be needed for plaster, sealants, and adhesives, and how long is needed will vary on temperature and humidity levels. Supplier and scheduling issues are another thing that can impede any project, so it’s always worth accounting for this in your plans, too. Certain features will also take longer to install than others – a fully tiled bathroom (including floor and ceiling!) will take far more time to finish, especially if you have an awkwardly shaped room, or have either a complicated or custom design. In fact, additional tiling can add anything from a few days to an extra week onto current project time! It may seem like a long time to wait when you’ve been told that a bathroom can be redone in as little as three days, but reputable construction companies value a quality finish over rush jobs, and will take the time to make extra adjustments and add the finishing touches that really tie the project together. If you’d like a more certain answer to the question “how long does it take to fit a new bathroom?” then contact NBC Construction today for a quote by calling 01252 338801 or emailing info@nbcconstruction.co.uk – we’d love to chat about your plans over a cup of coffee sometime!